This Friday acting Program Director of the media program Fo Wilson will be giving a short talk about her work and in performance with Ira Murfin, a theatre artist and scholar as a part of Our Theatrical Future: A Talk Duet Between Hong Kong and Chicago (Re-Performed). Wilson will be giving voice to a conversation Murfin had with his longtime collaborator Aaron Kahn who lives in Hong Kong. Sector 2337, 2337 N Milwaukee Ave. Artist Talk: Wilson will present examples of her work within the context of furniture and domesticity that question the role that objects play in domestic space and how we project our own identities and desires on them. She’ll also discuss how objects can not only have function, but exhibit behavior as a reflection of the human condition. “Talk Shows: Talk as Performance Material” – This lecture, based in a comparative project exploring the use of ordinary, extemporaneous talk by artists from disparate disciplinary backgrounds working in the post-1960s American avant-garde, introduces the cross-disciplinary histories and possibilities of talk as a performance genre. Ira is a graduate student in Chicago. Aaron is a yoga instructor in Hong Kong. They have been making theatre together and not making theatre together for over 20 years. On December 10th 2014 in Chicago and December 11th 2014 in Hong Kong they had a conversation via video chat over the internet, in the way it is possible to do now. They talked about theatre they have made together and theatre they have not made together and theatre they might make together someday. At each performance of Our Theatrical Future a different Guest Performer from a distinct artistic background, in this case invited by curator Caroline Picard, joins Ira to re-perform his conversation with Aaron, then Ira and the guest have a conversation of their own about making art and not making art, or whatever else comes up. Fo Wilson is a maker, educator, independent curator and writer. 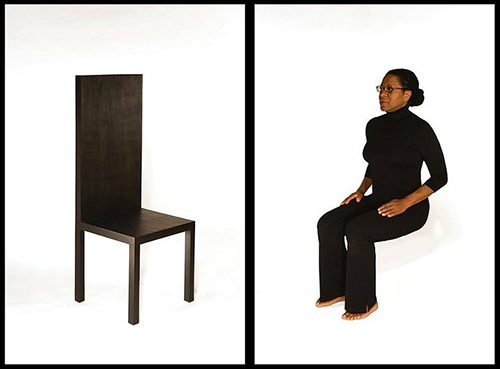 She uses furniture forms to create experiences that reposition historical objects and/or aesthetics in a contemporary context, and offers audiences new ways of thinking about and interacting with history and objects. Fo received her MFA from the Rhode Island School of Design’s Furniture Design program in 2005 with a concentration in Art History, Theory and Criticism and is an Associate Professor at Columbia College Chicago. She has been a recipient of a National Endowment for the Arts grant, and her design work is included in the collection of The Cooper Hewitt National Museum of Design in New York. Ira S. Murfin is a writer, theatre artist and scholar. He is currently a doctoral candidate in the Interdisciplinary PhD in Theatre & Drama at Northwestern University, where his dissertation examines talk-based performances in the post-1960s American avant-garde. Critical and creative writing has appeared in Theatre Topics, Theatre Journal, Theatre Research International, Review of Contemporary Fiction, 491, elimae, Fiction at Work, Chicago Art Criticism, Chicago Arts Journal, and Requited. His performance work has been seen at MCA Chicago, Links Hall, Rhinoceros Theatre Festival, and Chicago Cultural Center. Ira is a member of two theatrical laboratories: The Laboratory for Enthusiastic Collaboration (LEC), and the Laboratory for the Development of Substitute Materials (LDSM.) He is currently a Chicago Shakespeare Theater PreAmble Scholar, a Graduate Affiliate of the Alice Kaplan Institute for the Humanities, and a Humanities Without Walls Consortium Pre-Doctoral Fellow.